Thank you so much to everyone who entered the Seaglass Shawl giveaway last week! I wish I could have given you all a kit (including myself), but alas! There could only be one winner. So congratulations Kat! Your prize will be with you soon. Last week I set up the Seaglass Shawl CAL page on Facebook too. I honestly thought I'd be wafting around on my own in there like a lonely tumbleweed, but we have almost 30 members from across the globe already! If you'd like to join in, just click here. You can add friends to the group, too, and if you're not into facebook (or also into instagram!) you can use the hashtag #seaglassCAL on IG. 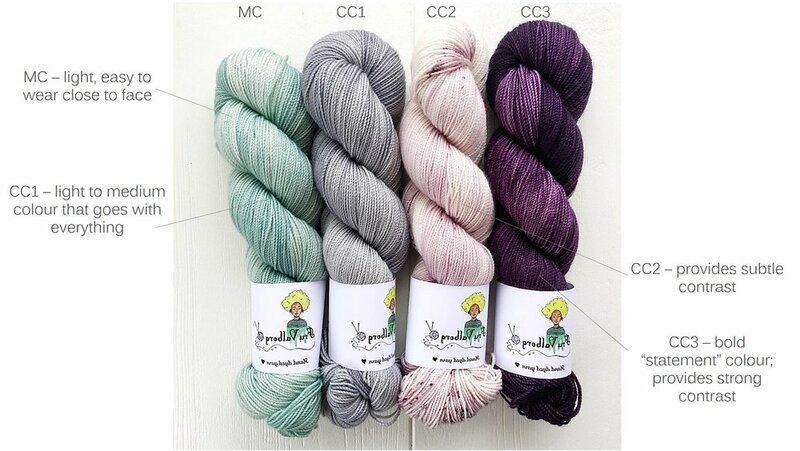 As the CAL doesn't officially start until May 7th, there's still time to get your yarn choices sorted out. In case anyone is struggling with what colours to combine, I thought I'd explain how Petra and I put together the kits. - what will look good closest to the face? - is there enough contrast to keep things interesting? - do the stitches come out as I intended them to or is the detail lost? Main Colour (MC) - the colour which gives the shawl its overall character, but which also needs to look good next to the face. Should not drown out the other colours, so keep it fairly light. Bonus points for speckles, which can then be picked up in the other colours. Contrast Colour 1 (CC1) - the colour which ties the whole multi-stitch section together. Should therefore look good next to ALL of the other colours. Can be light to medium in intensity, so as to provide enough contrast but still show off the detail of the cross-over stitch. Contrast Colour 2 (CC2) - complements CC1 but still provides some contrast. Contrast Colour 3 (CC3) - the bold "statement" colour used for the clusters and border. Be brave and choose something that provides a strong contrast. Here is what all of that actually looks like in practice. It's more of a fade rather than the light-dark, cold-warm contrasting palette of the others, and I therefore felt it didn't stay true enough to MY design. But does that mean it can't be YOUR shawl? Of course not. Part of the fun of putting a design out there is seeing how others interpret it, and as it happens I've seen a similar combination pop up on instagram already. I have no doubt it's going to be beautiful.